I used to call this an unnamed waterfall, only to discover that people have given it some type of designation. I’ve decided to refer to it as Pothole Falls, though some refer to it as The Potholes. This is one of the more widely photographed waterfalls/features in the park, even though it isn’t a very tall waterfall. Pothole Falls is found downstream from the much larger Manabezho Falls (which is downstream from Manido and Nawadaha Falls). While those falls are larger, they are “normal” waterfalls. Pothole Falls is really more of a collection of potholes, formed as rocks caused deeper erosion in the river bed. And while the potholes are not particularly large, they are very photogenic. I visited in early June 2006, and there was still enough water flowing down the river to obscure some of the potholes. If you visit later in the summer, less water flowing down the river will likely be a good thing, as the potholes will become more prominent. 1) From US-2 in Wakefield, head north of M-28 for a short ways. 2) Turn left onto Thomaston Road (whcih may be numbered County Road 519). 3) If it is not numbered Co. Road 519, you will soon end up connecting into Co. Road 519. From there, just keep driving north for a ways. You will end up entering the West Entrance to the park. 4) The parking area for the short trail to the Manabezho Falls is clearly marked. From that viewpoint, head downstream toward the bridge, if it’s in use. 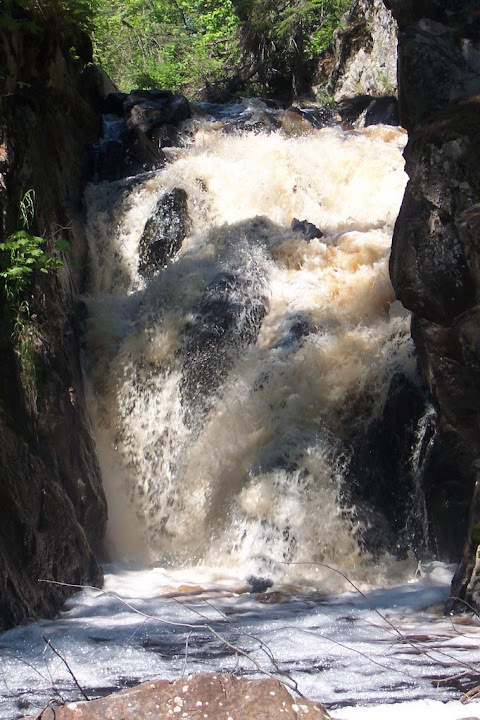 There’s only one other waterfall I can remember visiting before Black River Falls, so it’s not the first, but it’s pretty darn close. 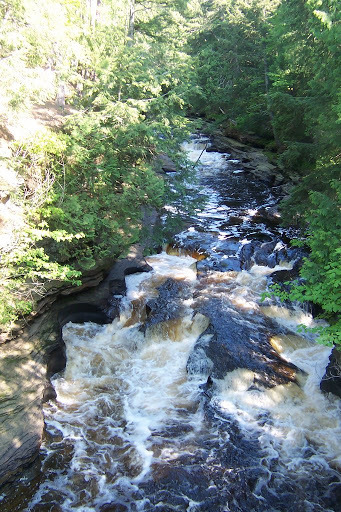 (Tahquamenon Falls wins that distinction.) I’m guessing this is the waterfall that set everything in motion, though. I had visited the Upper Peninsula of Michigan a few times because of a college friend, and had started exploring the area. She had mentioned that there was this waterfall nearby, and I joined along for the ride. Who knew I’d be approaching 700+ waterfalls eight years later. 1) From Ishpeming, head south on County Road 571 (or PI Road). 2) At the intersection with County Road 581 (aka Saginaw Street), turn right onto County Road 581 (heading west/southwest). Go about 8 miles after taking this turn. 3) On your right, you’ll see signs indicating “Island Lake Club” and “Falls.” Turn right here. 4) Go about 0.6 miles to a fork in the road. Take the right fork. 5) Drive for another 0.3 miles on County Road CCP. You should see a sign that says “Falls.” Turn at that sign and go to the end, where you’ll find a parking area. 6) Head right to the river, where you should hear the falls, even from the parking area. 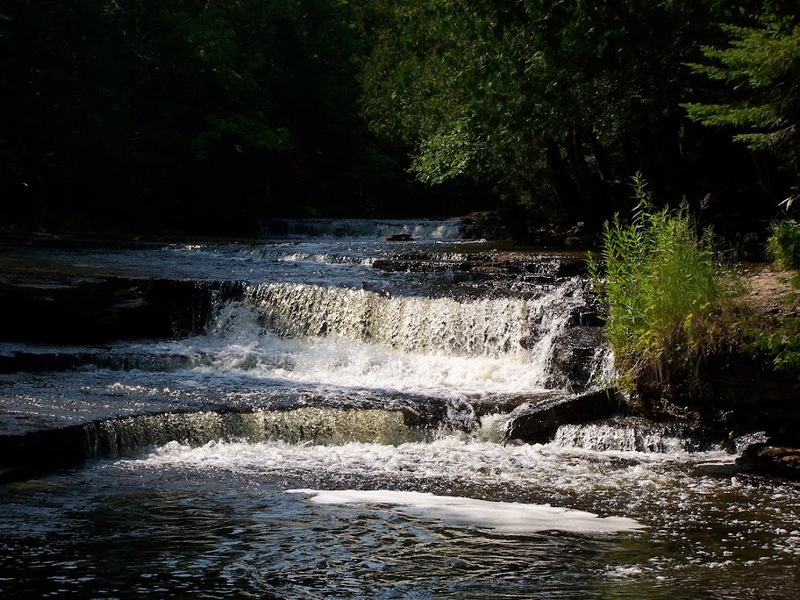 Just outside of Ironwood and Hurley are two waterfalls found within a short distance of each other. The short distance between the two has created a significant amount of confusion about the identity of the falls. Some books have referred to the falls as Interstate Falls, while others called it Peterson Falls, or both at the same time! It ends up that Peterson Falls is the upstream waterfall, while Interstate Falls is downstream. I’ve visited Peterson Falls twice, and the visits could not have been different. On the first visit August 2008, there was enough water flowing to call it a waterfall, but one could probably rock hop to the Michigan side. You could actually see three separate portions of the falls. It is much easier to visit them from the Wisconsin side, so follow the directions below to ensure you’re standing in Wisconsin! Interstate Falls is to the left on the trails. Peterson Falls is to the right. At one point the trails intersect, but it can be a little bit confusing. Just don’t leave after seeing only one waterfall! They’re very close to each other. And if you’re exerting yourself to see either falls, you’re probably not on the right path. Both falls are very easy to visit. 1) From Ironwood/Hurley, head west on US-2. You will pass from Michigan into Wisconsin. 2) After a short distance, you will see Center Drive on your right. If you take a look, you will even notice a white sign for one of the falls. 3) Turn right onto Center Drive, a dirt road, a head down it. At one point, you will veer right. 4) There is a dirt pit in the area, so that’s likely how you’ll know you’re in the right area. The road is blocked by a small “rock wall”. From this sandy parking area, head down a well-worn trail to the falls.